see the function AudioRecord. This android function actually converts your Audio data in some discrete form using Pulse Code Modulation (remember Nyquist theory of Sampling) and stores in a buffer the size of which we calculate using the AudioRecord.getMinBuffersize function. These discrete values are then passed through a library function called RealDoubleFFT.ft to get the fourier co-efficients. These co-efficients are then plotted in the graph. So, in short to answer your question your voice goes to a buffer of discrete values. RealDoubleFFT_Mixed.java class. What are those many letters was for? Great work by the way. thanks for sharing! Hi! Could I ask why it's necessary to divide each element of buffer array by 32768.0? Where did this nuber came from? I used both this and "Pro android Media" but I think this works better. But when I touch a button for stop and touch one more for restart, the spectrum usually goes down - it lives less than 5 seconds and doesn't work -. Could you give me an answer about the matter? @Hwan it is working in the same manner in my device as well. once you start the app and rotate you will have to press the start-stop-start button. then it works. i will look into the matter. @Somenath Yes, I just press button one more time and it changed start-stop-start. However it still doesn't work. I wonder if you are cell is different with me. My cell is Galuxy III and the system version is 4.1.2(Jelly bean) I can show you the screenshot and I appreciate to you if you show it. @Hwan, my device is Samsung Galaxy Y having Android 2.3.6. However, i would like to say you that i tested this app earlier on a different Galaxy Y phone which i think had Android 2.1 or 2.2 and it worked perfectly there. I am not sure what is happening. anyway i will look into the matter. Is it ok if I ask you a question? Instead of showing the frequency on the "imageView1"? Is there any way to save as file? And as you know, is there any way to company the frequency based on Spectrum Analyzer? I will appreciate much if you can help me. It is great to see your code. 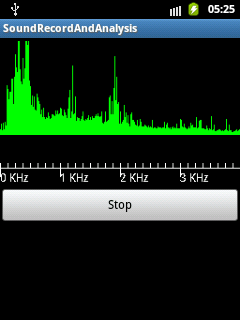 I'm an Android beginner and I would like to make an App to detect audio frequency up to 20Khz. Your code is really helpful. I find the int frequency 8000 is limited to audio input of 4Khz. In case of detect up to 20Khz, I change the int frequency from 8000 to 16000 and works fine for audio up to 8Khz. But when set frequency to 40000 ( bcoz I want to detect max 20KHz ), the screen cannot show the graph. Could you please advise how I can modify the code to achieve such wider range frequency ? thank you very much in-advance. @Keith, i think at present the maximum sampling frequency supported by Android is 44.1 khz. hence according to the nyquist theorem the maximum audio frequency it can support is approximately 22 khz. however, it all depends on the actual hardware device. i am not sure which device you are using. but please do a bit research on your device capability vis-a-vis audio frequency. I also doing this kind of project. Do you know how to make graphics that contain value of frequency as x axis and value of sound level as y? thank for sharing your code! this really helpful, but do you know how to get the frequencies in this project and make a graphic that draw the frequencies as x axis and sound level as y? Hi! thanks for sharing your code! this really helpful. I want to get the frequency value from recording and draw graphic with frequencies as x axis and sound level as y, do you know how to do that? I hope you can help me..
i would like to know how it is possible to get the frequency of a note played with an instrument... with this code i can display its graph, but what about the frequency? Thanks for the code. It works fine on my phone. I would like to know how to take inverse fft of toTransform. Also what are the real and imaginary coefficients of the fft contained inside toTransform. I will greatly appreciate your input on this. Thanks for this informative post and the code. I am new with Android. I downloaded the project from Git and tried to import it in Android studio, but the import failed. Could you please let me know if I am missing anything? Interesting, I can't seem to se a link to the code, would really like to have a look for a research project, but can seem to find the link. Anyone still have a link or does this still function? Can I ask what is the meaning of negative value after doing FFT? Is it an imaginary part? Thanks.